I don't get to Greenpoint nearly as often as I should. Some weekends I find myself longing for Paulie Gee's pizza or Peter Pan's doughnuts (who am I kidding, I'm longing for Paulie Gee's pizza AND Peter Pan's doughnuts). A recent food adventure brought me to Blondie's hood, but before we could get our mission under way, we had to fortify ourselves with some sweet, fried goodness. Over time--we're talking many years here--I've discovered that I don't actually hate coconut. Contextually coconut, under all the right circumstances, can be delicious i.e. coconut buns from Mei Li Wah and Curried Coconut Soft Serve from the Big Gay Ice Cream Truck, as opposed to cloying--Mounds Bar, I'm looking at you! Toasted coconut is in good hands at Peter Pan Bakery. 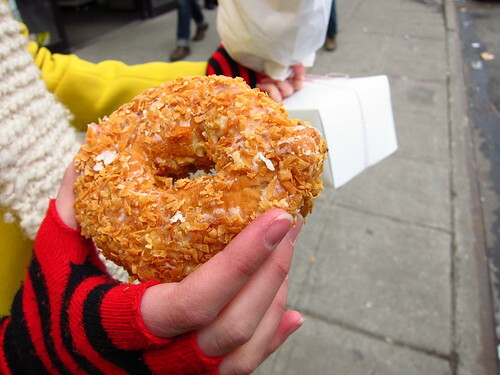 The doughnut was pleasantly squishy, as yeast doughnuts are want to be, and the glaze that adhered the toasted coconut bitties gave it just that right hint of sweetness. My only regret is that I got but one doughnut because it disappeared with lightning quickness. I just had my first one of these babies last week--usually I'm a marble cruller girl all the way. I had no idea what I was missing: that is one fine donut. I need one of those right now. It looks unbelievable!